Hammer Films is best known for its work in the horror genre, churning out reliably eerie exercises in Gothic terror that resurrected such classic characters as Dracula, Frankenstein, and The Mummy for a new audience in the 1960s. So The Pirates of Blood River seems a bit of an odd fit for Hammer. It contains no monsters, nothing supernatural; just a band of rowdy pirates lead by the brooding Captain LaRoche (Christopher Lee). Our hero is Jonathan Standing (Kerwin Matthews), a Huguenot pilgrim living on a Caribbean Island run by his devout father, who has turned their little colony into a theocratic nightmare. Standing falls in love with a married woman, and is summarily banished from the colony by his own father, after his beloved rushed headlong into Piranha-infested waters (giving the film its titular Blood River). Upon escaping from the penal colony, Standing runs headlong into Captain LaRoche's crew, and strikes a deal to get himself back home. But LaRoche is on the hunt for treasure, and he believes the Huguenot village is full of it. Standing soon realizes he may have gotten more than he bargained for, as LaRoche shows that he will stop at nothing to get the treasure, and finally find a place to settle down and retire from pirating. That's part of what makes The Pirates of Blood River so unique in the pirate genre - LaRoche doesn't want the treasure for the treasure's sake. He's tired and ready to lay down his sword and live the good life. You can see the world weary sadness in Lee's eyes - he's tired of death, tired of killing, and ready to put it all behind him after one last raid. It's a disarmingly soulful performance in an otherwise average film. But coming from an actor like Lee it really shouldn't be surprising. He commands the screen whenever he's on it, with his lilting French accent and hangdog elegance, he elevates every scene he's in. This film is a mostly standard swashbuckler, but it's an awful lot of fun. It may not be your typical Hammer film (the bloodthirsty piranhas offer the only moments of horror), but it's still a stylish adventure, lovingly rendered in all its Technicolor glory on the new Twilight Time Blu-Ray. It also offers a glimpse into what could have been had Hammer ventured out of their comfort zone more often. 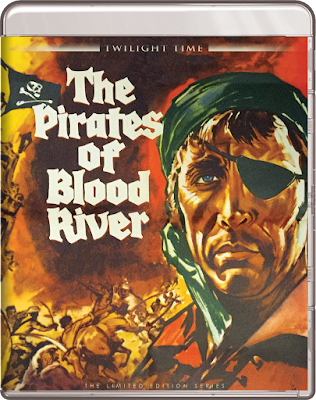 The Pirates of Blood River may not quite be on the level of their classic horror films, but it's still a rollicking high seas adventure with a strong villainous performance by Christopher Lee. What more do you really need? Now available on limited edition Blu-Ray from Twilight Time.